The ruby is so named because of its rich red color. The non-red variety of corundum is Sapphire, which are well known among the general public as being blue, but can be nearly any color. 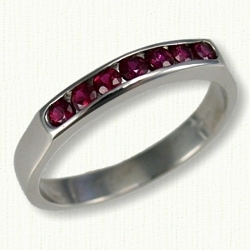 The red color in ruby is caused by trace amounts of the element chromium. The best shade of red for ruby is often given the name "pigeon blood red", but ruby can be any shade of red up to almost pink. 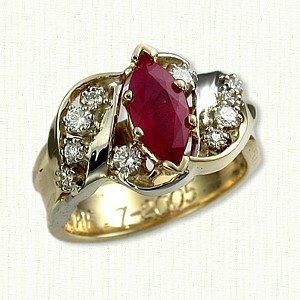 The ruby is a very durable gemstone; its hardness is surpassed only by the Diamond. It is the second hardest natural mineral known to mankind. Large rubies are very scarce and costly, worth more than 2 to 3 times a Diamond of equal size and quality. Rubies were thought to contain a glowing spark struck from the planet Mars. 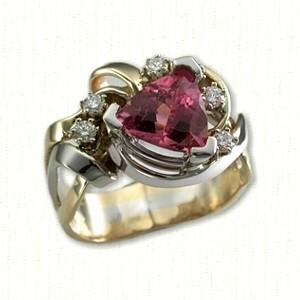 Ancient lore held that the ruby was capable of curing illness and reconciling lovers quarrels. Hindus referred to the ruby as 'The Lord of the Gems', and believed its deep red color came from an inextinguishable fire which was capable of boiling water. It is said that a person should never make faces at a ruby in a museum, and never ignore it, for it was said to grow dull if slighted or not worn or seen. Rubies come from Burma, Thailand, Kenya, Tanzania, Cambodia, Sri Lanka and India. 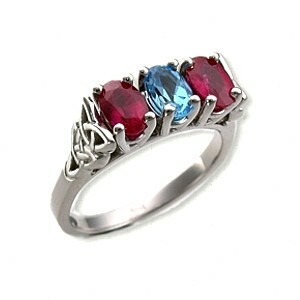 It is the accepted gemstone for July birthdays, also 15th and 40th anniversaries. 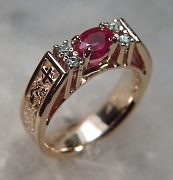 Shown: 14Kt yellow gold 'Kathryn' with a 6x4mm oval ruby and four 2mm blue zircons. 10 diamonds, 5 amethysts and 5 rubies (stone size .03ct each). 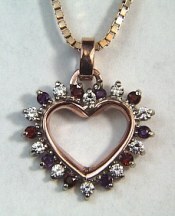 We can set any combination of .03ct stones in this style pendant. 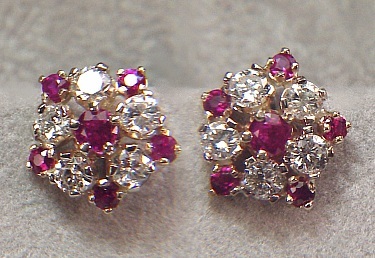 Custom Ruby & Diamond Earring Studs Each stud has five diamonds and 6 rubies.